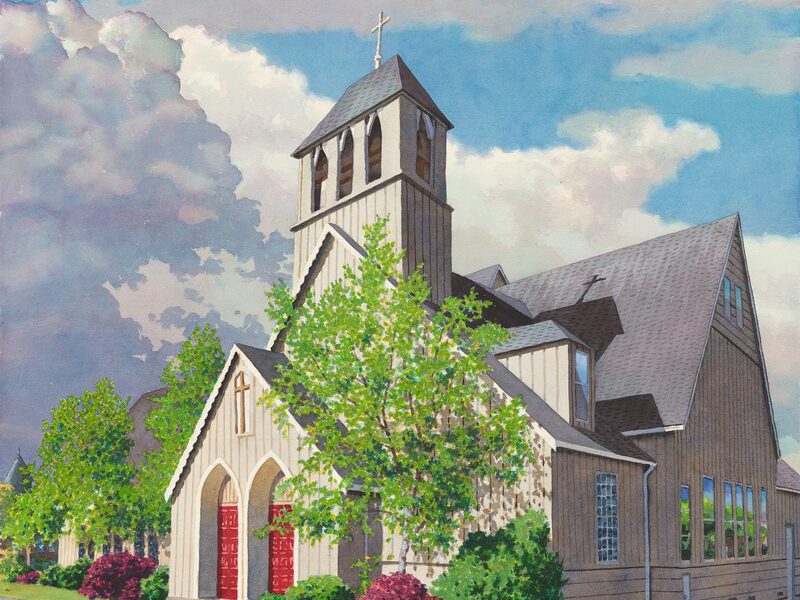 I’m definitely a local – born in Eureka and baptized here at Christ Church as a baby followed by confirmation at the age of 11 and reaffirmation a few years ago . I felt God’s call when I was attending Eureka high school but this was around 1958, 18 years before General Convention voted to open ordination to women. With no place for me in the church, I continued my education, graduating from Humboldt State with a BA in Art in 1964, and then further education at San Jose State (1964-1967). After working for two corporations during and after my education while in the Bay Area, I moved back up to Eureka in 1972 to open The Art Center in Old Town which, after 26 years, I sold to two of my employees in 1998. This was a way to utilize my knowledge of art and the business skills acquired via my work plus family orientation. I would feel God’s call from time to time but would dismiss it as not possible as I didn’t believe the way I thought was necessary for one so called. In the mid 80’s I finally opened myself up to God and began the long process of listening and learning culminating in my ordination as a Deacon with 7 others including our Archdeacon Pam Gossard on August 13, 2016. In addition to serving as Deacon with Pam, I schedule and share in training the Acolytes and Eucharistic Ministers, the Prayers of the People Team and Eucharistic Visitors, and offer anointing and healing prayer. Outside Christ Church, I have been a Volunteer Chaplain at St. Joseph Hospital for over 17 years, am on the board for Hospice of Humboldt, and own the McKinleyville Shopping Center in McKinleyville (since 1998). I used to fear the closing words of our Rite II Confession – “… that we may delight in your will, and walk in your ways,…“ but now I embrace these words because they have brought me a sense of peace, fulfillment yet continuing challenge. May they also be so for you.